I want you to picture me as a cute little anime character that popped out from behind a mushroom or something and landed in Hollywood. But writing about my struggles was actually really fun. Besides, who wants to read about success, anyway? Is Everyone Hanging Out With Me? is the 9th book I’m reading for my Before 25 Bucket List! 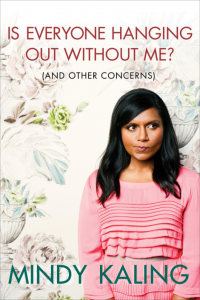 I love Mindy… always wonder if she’s exactly like her character. I kind of imagine she is! Sounds like this could be a light, entertaining story.